Micropeak is a barometric logging altimeter for precision model rocketry altitude measurements. Data download is available using the MicroPeak USB adapter. The MicroPeak manual is available in html and pdf formats. The MicroPeak application runs on Linux, Mac OS X and Windows. It communicates with the MicroPeak USB adapter to download and analyze flight data. It's written in Java and offers the same functionality and interface on all three platforms. It uses the FTDI USB Serial drivers to communicate with the hardware. If you're running Mac OS X or Windows, a compatible version of those drivers is included with the software. You can also install a different from from the FTDI Driver page. MicroPeak is part of the larger AltOS suite of software, which also includes a dedicated TeleGPS application. Fetch correct TeleBT v4.0 RF calibration values from web site when reflashing. Add documentation about forcing TeleMini RF parameters to known values. Fix Java version info in all distributed jar files so that applications will run with standard Mac OS X Java. Replace JavaApplicationStub for Mac OS X so that applications will run with Oracle Java. Ground testing EasyMega and TeleMega additional pyro channels could result in a sticky fired status which would prevent these channels from firing on future flights. Fixed saving of pyro configuration that ended with Descending. Add new Huge font size to make text even bigger on high resolution monitors. Measure ground pressure and peak altitude pressure. Orange LED blinks out maximum height in decimeters. 18mm x 14mm. 1.9g including battery. 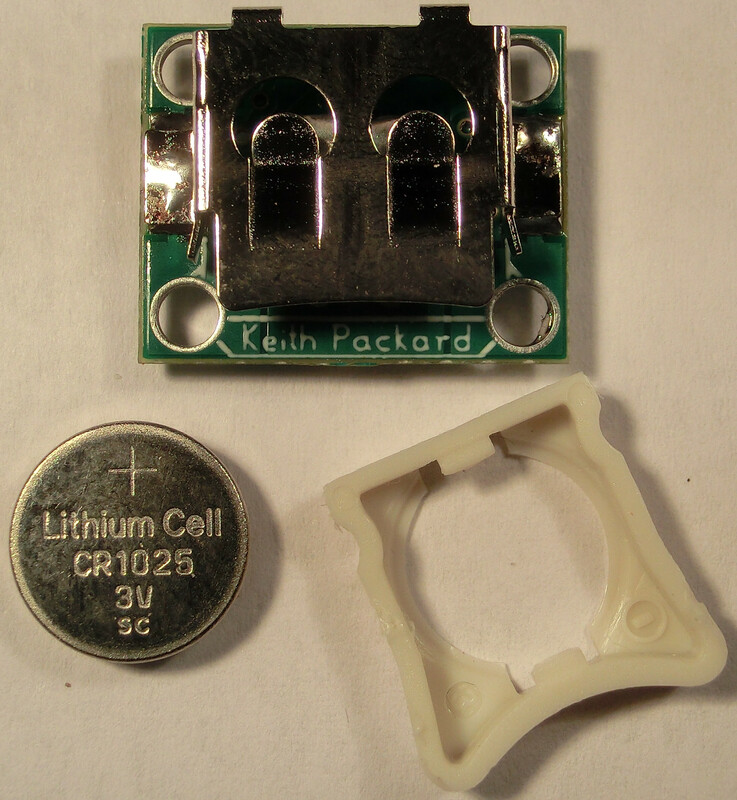 The CR1025 battery holder is mounted on the back side of the board, so there are no external wires or batteries to manage. Saves last flight data to non-volatile memory. Reports previous flight on power-on. Automatically shuts down on landing to preserve battery. 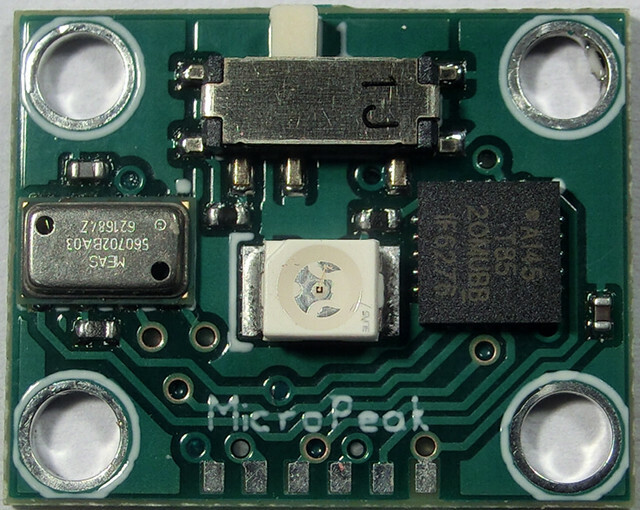 MicroPeak includes an integrated battery holder on the back side of the circuit board. Standard 6-pin AVR programming interface. Exponential averaging filter to minimize transient effects.